← Why Were Aquila and Priscilla Forced to Leave Rome? I think that the biggest reason why Paul was so successful in Ephesus is sort of the “right place at the right time” argument but more so that God was honoring his obedience. We know that before Paul went to Philippi in chapter 16,he was thinking about going to Asia Minor (6 Paul and his companions traveled throughout the region of Phrygia and Galatia, having been kept by the Holy Spirit from preaching the word in the province of Asia.) but that the spirit had kept them from going there. I think that later on when Paul and his companions were allowed to go back to Asia Minor and Ephesus, the Lord honored that and caused His success. That is why i would say it was kind of right place-right time, but mostly the Lord honoring his obedience. This maybe a cop out answer however I feel like this is the one that lasted the longest solely based on the Holy Spirit and his leadings. We do know its in ideal place to reach out to asia minor and ports that it may help spread the message and those are all things to consider why Ephesus. However I think this again comes down to the Jacob and Esau argument of why God chose what he chose. God could have used several other cities but that is the one he wanted. I think this was also one of those blessing moment for Paul whom had been pouring out his heart to get run out of a city and get miss treated, it must have been nice to finally have a place to stop and set down roots if not for a short 3 years. I dont see a reason why this city would be any different then some of the others, he gives the message, people accept and reject him, the only difference was nobody made him leave, and if hes preaching his heart out without being asked to leave, he isn’t leaving. Paul was not in Ephesus 3 years. Or do you believe that Luke made a mistake? Acts 19:1-7 tells us that Paul found disciples on his way into Ephesus. I assume the through way it was written in the Bible that he found disciples and then entered the synagogues to win over more hearts. I believe that might have been a reason that his ministry was so fruitful there in Ephesus. In Acts 18:24-28 it talks about how Apollos came to Ephesus as well. I think that timing might have been a part of it in that case as well. It does not seem very clear that Paul did anything very different here than anywhere else he went. From reading Acts 19 it sounds to me as if it was not Paul’s work but the work of the Holy Spirit through him and the hearts of those listening. Apollos was successful in his ministry – and he would have been more successful if the jealous New Testament Saul (Paul) had not been constantly undermining him, and clinging to power as an abusive absentee leader of the Church in Corinth. Who exactly what Paul writing to? He doesn’t address this letter to anyone by name. WHO exactly is “Paul’s letter”? In other words, Paul didn’t have anyone to recommend him – except maybe his young helper Timothy, who was doing “long-term temporary” pulpit supply because Paul refused to delegate any real authority or allow a new leader to be appointed in Corinth. Success is defined as (according to Oxford Dictionaries): “The accomplishment of an aim or purpose” Generally we would count success as only a positive experience, or in this instance, a stay of great length serving the Lord, but maybe this is just a time for Paul to encourage those around him before returning to more strenuous ministry. Perhaps even his health may have restrained him, or that his disciples were able to gather, and they needed to theologically come to agreement on many topics that Paul could advise on. In any case, I have a hard time saying that this was the most successful time in Acts, as God accomplished every purpose He intended through Paul’s ministry in every area of his world. Even in beatings, imprisonment, humiliation – God was at work, and even in the towns where only one or two converts were mentioned, God accomplished success through Paul. With this in mind, Paul may not have measured his success the way we see it now, perhaps he was longing for opportunities to minister again to the least of these. 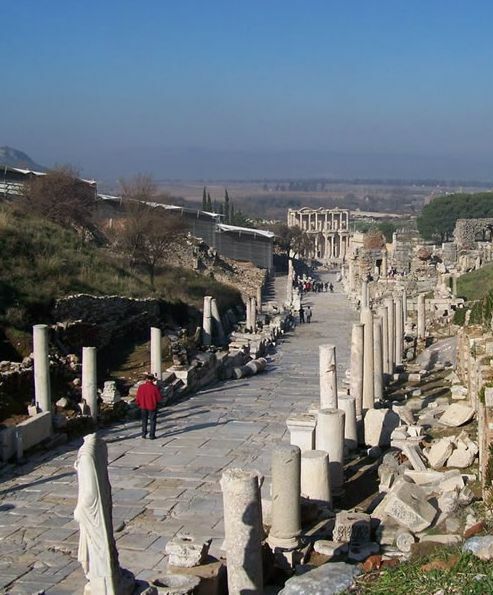 How long was Paul in Ephesus? No one can know for sure what was really “in the mind of Paul” – you might argue that Paul really thought he had been there 3 years, so he wasn’t lying. Or he was rounding up, from 2.25 to 3. If you want to believe that Paul didn’t intentionally exaggerate, fine, you can believe that, I won’t argue. But what is not debatable is that Paul claimed something about himself that was not true, according to the Scripture record. Either it was 2 years 3 months approximately, or Luke made an obvious, stupid error. I believe Luke did not make an error, but rather Luke accurately recorded what happened – because I don’t let the “voice of Paul” override every other voice in Scripture. Paul’s time in Ephesus might have been his most successful ministry but he still faced opposition and hard times. The first few months of Paul’s stay in Ephesus was filled with eventful struggles. In 1 Corinthians Paul comments that he fought with beast. And faced many people who opposed him. Regarding why he stayed there for so long. In 1 Corinthians Paul says “because a great door for effective work has opened to me, and there are many who oppose me”. In Ephesus Paul had a great opportunity to preach and teach about the gospel to those who opposed him. Also there was a great number of those who didn’t agree with him. Paul felt that he needed to reach to these people. Do you agree that the approximate length of Paul’s time in Ephesus was 3 months in the synagogue and 2 years daily in a lecture hall. [Acts 19:8-10] ?Or do you believe that Luke made a mistake? It was very interesting to study the city of Ephesus for my paper. The city was very diligent and loyal to Artemis their goddess. The city was also one of the biggest cities that was good for commercial business which gathered many people from different places. I think it was just the leading of the Holy Spirit that was within the hearts of the people that in Ephesus. It emphasized the work of God within the people of Ephesus because they were very loyal to their goddess, Artemis. Even among the cults and other religions with Ephesus there was a strong Jewish community that was faithful to God. Those who were converts like Apollos, Aquilla, Priscilla, and others were evangelizing within the city of Ephesus. Paul had help spreading the gospel which is easier than doing it by himself. 1 Corinthians 16:19 talks about the churches of Asia, which could be an indication that there was a church-planting program. Aquila and Priscilla did take on the responsibility to help new converts adjust to their lives by providing a place for them to live. God used many different people with Ephesus to help carry on the good news. His work will be done and He will make a way for it to be accomplished. Paul didn’t plant a church in Ephesus, and he wasn’t in charge of the church in Ephesus, or in charge of all the work in Ephesus, even though he wanted to act like he was. No, Paul set up his own school there, where he taught daily for 2 years. There are numerous other people who deserve credit for the work in Ephesus establishing and nurturing a church there, before Paul ever even got there, and after Paul left. In Revelation 2:1-7, The Apostle John records the voice of Jesus warning the Church in Ephesus about “those who claim to be apostles but are not.”. We have often been taught that John wrote Revelation much later, like 90 AD, but that was a tradition that took hold later. There is no good reason to believe that Revelation was not written earlier, and Revelation 2 is probably a fairly direct reference to Paul the self-appointed apostle who claimed to be an apostle but is not. Just like Phil Long said, “Paul’s years in Ephesus are perhaps his most fruitful times in ministry” (Long 2015). When reading about the different things that Paul was able to do in the city of Ephesus I would agree that Paul’s times in Ephesus was the most fruitful or beneficial. Paul is able to speak freely, and share the gospel in the Synagogue while there. I think that there are a few things that contribute to the success of Paul in Ephesus. One of those contributions is that Paul meets other Christians while there in Ephesus. Another contribution is that he was able to speak freely while in the city. I also think that another contribution of Paul’s success was that he was in the right place or city at the right time. Even though I think that all of these things contribute to the success of Paul, I also think that the main contribution of Paul’s success was the power of the gospel. The gospel is used for many different things, and the power of the gospel changed people in Ephesus. A scripture that came to mind when thinking about the power of the gospel being the main contributor of Paul’s success in Ephesus is 2nd Timothy 3:16-17. 2nd Timothy 3:16-17 says, “All Scripture is breathed out by God and profitable for teaching, for reproof, for correction, and for training in righteousness, that the man of God[b] may be complete, equipped for every good work.” These are the things that I feel contributed to the success of Paul in Ephesus. Was Paul writing letters to Timothy when Timothy was an infant, and unable to read? Or was Paul referring to the Law of Moses and the Prophets, and maybe the Writings section of the Old Testament, since the New Testament had not been written yet? When Paul wrote the words “the holy Scriptures” in verse 15, was Paul referring to something besides his own letters? But then in the next verse, verse 16 when Paul wrote the words “All Scripture” he instantly changed, and was referring to his own letters, and “The 66 Books of the Bible” as being “breathed out by God.”? Is there any other author of the New Testament who you can quote to back up your view of “what Paul really meant”? I would have to agree with Victoria. In Paul’s journey the Lord interfered twice with him and his men being able to go through to Asia Minor and Ephesus. The Lord had a plan and Paul was able to obey and trust in the Lord. When the Lord wanted Paul to go, he was very prosperous. He was able to speak freely with the people and spend a lot of time there. In Acts 19, we see Paul’s ministry in Ephesus to be quite successful. Some factors that attribute to this may be having other Christians here with him. This would probably be seen as an encouragement to him as he would not be alone in working through issues and brainstorming. Another factor that would attribute to his longevity and success would be the people and their hearts, in Acts 19:2, Paul meets up with a few people asking if they believed in the Holy Spirit and they did not even know who the Holy Spirit was, not only John’s baptism. If this reflected more people in Ephesus, it would be a good potential field to minister too, because they have no prior beliefs. We do see that he runs into difficult people in the synagogue, and he goes away from that to start a new group. This could have helped his way of doing ministry, to focus on new believers and not individuals stuck in their traditional ways. While in Ephesus, Paul probably did not completely do something different, but his experience from Philippi and Thessalonica would have increased his knowledge on working with people and understanding what to say and when to say it. In doing ministry you constantly have the opportunity to change the way you do things, with the goal in mind of improving, Paul could have been working on new ways to work with people and just having the experience and wisdom of what to say. Although Paul traveled to other places after this and he could not stay there as long, so we definitely know the success was partially due to the people and their hearts overall. Whenever I think of Ephesus, I want to immediately think of Paul’s letter to Ephesus (the book of Ephesians). It’s definitely true that every ounce of what God wanted Paul to do as far as his missionary journeys, was accomplished throughout the book of Acts but it was in Ephesus where majority of the fruit was being spread. It’s so cool to me that Paul always went to the local synagogue (Acts 19:8-9) to share the Gospel at. Paul’s knowledge of the Jewish people (because he was a Jew) was so rich that he was able to relate to them and plant the seed where fruit was able to prosper. The Jews were able to have prior understandings of the scriptures where the Messiah was talked about. Through this, I don’t think Paul did anything different in Ephesus than he did in the other places he visited but instead the Holy Spirit had bigger plans. Paul’s sense of boldness is definitely a big reason of why Paul had success and should be an inspiration to all Christians and people who have a future in preaching the gospel and evangelism. Paul’s mission work in Ephesus is very successful. We see that the words that he spoke to the people in Ephesus were received in a way that would allow Paul to be successful. One of the factors that may allowed him to be so successful was that there were already a crowd of believers that lived there. Paul was able to enter into a city and was able to spend time with like minded people, rather than enter into a city where there was very little Jewish influence, like the city of Philippi in Acts 16. The fact that there were other beliers there to start with may have renewed Paul’s strength and encouraged him to share the gospel here in Ephesus as well. He was able to use the group of believers that were already there trying to spread the gospel and go off of their work to reach those in Ephesus that didn’t yet believe. Because he was able to build upon a ministry that was already in place, it may have been easier for him to spread the good news. I don’t think that Paul did anything differently, but that the hearts of the people were already prepared to hear what he had to say, because of the believers that were already there. I find your take that Paul didn’t do much differently to reach the people of Ephesus. I agree with you but, have a twist to it. I believe Paul knew that if he spent more time in Ephesus he could reach out to the people and get the whole city aware of God’s love. By the end of the journey the people of Ephesus were praising the Lord in the streets. I agree with you 100 percent on this. This may have been Paul’s most “successful” missionary journey. Paul spent more time in Ephesus than he did any other place along his journey. He had to deal with many different issues in Ephesus. Ephesus was a beautiful place and had a lot to offer, but it was also full of sin. It had sorcerers, magicians, and exorcists that roamed the streets. He encountered people who were infatuated with and worshipped the goddess, Artemis. By the end of Paul’s journey in Ephesus, three things had happened in Ephesus. The first being that he had brought awareness to the city and that they were now a God-fearing city. Second, they were praising the name of the Lord Jesus. It was a precious name to them. Finally, he had the magicians and sorcerers getting rid of their magic formulas that they were using (Campbell, 308). Paul had to have an insane amount of courage in order to do this. He had an immoral city and he had a bunch of tough choices that he had to make. The one that really surprised me was when he was in front of the Sanhedrin and he said that he was a Pharisee on trial for believing in the resurrection. That is a tough thing to say. They had a plan to kill Paul after that. So, it took major courage and Paul turned a sinful city into a place where they were proclaiming the name of Jesus. Campbell, D. K. (1961). Paul’s ministry at Ephesus: a devotional study. Bibliotheca Sacra, 118(472), 308. I agree with everything that you have said here. He definitely was able to do a lot more here than anywhere else he had gone to for God’s work. I like the point that you made about Paul having to have an insane amount of courage to do what he did. Paul just went to the gutter, a place where no one else wanted to go to because they were scared of what could possibly happen. Paul’s work in Ephesus took the longest out of all the trips during his journey. With all the time that Paul spent Ephesus this was one of his most successful trips and the reason I think was because he invested more time into it. Ephesus was a city full of magicians, sorcerers, ext which sent the wrong message to the rest of the city. Paul knew that it would be a challenge but, continue to work. Through Paul’s work God was able to turn Ephesus in to a God-fearing city where people began praising the Lord. Paul spent time on these people and God came through and touched the people of Ephesus even the magicians and sorcerers. As Christians we must to take time to reach out to those who don’t know Jesus. If we are willing to be patient and continue to preach God’s word God will reach them. Just like Paul did in Ephesus we have to be patient if we throw the Bible into people’s face it will bring the wrong message that God wants us to share. Paul was a man who was zealous for the Lord, in everything he did he chose to do it with all that he was in order to be able to share with the most people he could about the saving Grace of God. Paul went on various missionary journeys to many cities each filled with their own culture, thinking and religious cults. It is interesting to see how long Paul stayed in Ephesus and how it was one of his most successful missionary journeys. Paul stayed in Ephesus for 3 years preaching and reasoning with the people there. Paul upon entering into this new city does as he always first did which was go to the synagogue. He was able to preach and teach there for three months. It blows be away to see the contrast that he had with other cities such as Thessalonica where he was not able to stay long at all because of the opposition he faced in this city. I think that the Holy Spirit was at work in this city and that God was able to use Paul’s courage to bring many to an understanding of their sinful condition. People also had very few prior beliefs which would lead to more openness of hearts to accept what Paul was preaching. It really is so cool to see how God works, He opens and closes doors everywhere we go in life. Just as Paul came across places where he was unable to help the “stiff headed people” he was able like in Ephesus and Berea able to make an outstanding difference for the Lord. This should be a great encouragement to keep on going because you never know the people you will touch. The 3 year period that Paul spends in Ephesus is interesting. It is of course the longest permanent place of ministry (as mentioned in the article), but why did he stay so long? I think the in class discussion in BI 308 was intriguing, regarding the “tears and trials (Acts 20:19).” Is it possible that Paul actually spent 3 years in Ephesus because of imprisonment? It is obvious that the Jews did not like his ministry or message at the time (Acts 19:9). Paul mentions in his meeting with the Ephesian elders that he had to navigate the plots of the Jews (Acts 20:19). I wonder if perhaps Paul had a fruitful ministry, but was delayed in traveling because of imprisonment? It would make sense for Luke to include this in his writings for sake of clarity – but at the same time, Paul is imprisoned so often that maybe Luke did not think it was important enough to include another imprisonment in his writings. I would also agree with you that what Paul was able to do in his time in Ephesus was the most successful out of everything that had done. I say this due to how because this was his third missionary journey that he was sent on by God. I like how you asked the question about how was this specific missionary journey different from the others and why it was more successful than the others. I mean, if you really think about it, Paul did not do anything super different than he did with his previous two missionary journeys, meaning he pretty much took the same exact steps as he did with his third journey. What I feel that was the thing that helped with making this one more successful was the fact that more and more people that were in Ephesus heard about the events that transpired in both Philippi and Thessalonica and how certain people were treating Paul and the people that joined him on his missionary journeys. I feel that once these people heard of these events and the fact that Paul and the people that he had traveling with him were actually speaking truth about God and the love that God has for everyone, that the people in Ephesus had a really good idea of what they were to expect and then also already understood what exactly Paul was peaching about all along. To me, Paul’s time in Ephesus sounds very similar to his time in a lot of places. He speaks with boldness and does not hold back anything. He says it how is no matter what the consequences may be. Another similarity is that the people are unhappy by the stuff he says and reject it. That seems to be another theme with the places that he goes. He speaks with boldness about the Kingdom of God and the people do not like to hear this stuff that is foreign to them and different than what they believe in. I do not think that he did anything different. The people in Ephesus must have been slightly more tolerant than people in other places since he was able to stay for so long.